The best nights sleep of the holiday for all of us ends at 9:00 am. Now, today is the first REAL day of our holiday as its our first full day in WDW. A brief breakfast in the room and we are out to Stormalong Bay by 10:00. Amazingly, it is packed already, although the girls manage to find 4 sunbeds. The pool itself is so large and convoluted that it never really seems crowded even with hundreds of people around. This may just be in comparison to the cruise where you would be hard pushed to squeeze a Mickey Mouse waffle between the bodies crammed together in the 5 ½ square feet of water. The weather is 90 degrees and set to stay that way for the next few days with isolated thunderstorms. We havent experienced these sort of temperatures for a few years as we have tended to go in October or November. Its not that bad and the thing I am enjoying most is the night time where you can still wear shorts and fell comfortable. That strange sensation of walking from an air conditioned room into the humid Florida night is always a pleasure. Ind, George and I try the waterslide for the first time. Not bad! Poor Georgia is itching to get a double ring and float around the lazy river, but they are all out. She keeps going back to see if any are available (you can rent them by the hour) and coming back disappointed. Eventually one is returned and she and India can mess about for an hour before lunch. We decide to eat at Beaches n Cream and have a 30 minute wait for a table. While waiting we chat to 2 couples looking at DVC literature and tell them how good we think it is. I should be on commission. We sit at the counter in Beaches n Cream and Tam and I split a double burger while India has a hot dog and Georgia the mini-burger. You cant come here without having a sundae and we go for the Fudge Mud Slide, which is great. We take turns at it and Im sure I get the worst of this arrangement. Could be because I insist on using a spoon instead of just thrusting my face in it like the other three. Lunch takes us up to 3:00 pm when we go to the quiet pool at BCV. Even with most of the sunbeds taken it is still not too busy and is a delightful setting. I think that this is nicer than the quiet pool at BWV, although theres nothing wrong with that one either. The girls swim for a while then rest on the sunbeds. India wanders off to look at the pond and calls me to look at the turtle swimming about. As we survey the scene out drifts the famous BCV alligator. Hes probably only about 4 feet long (I know its a he because he doesnt look vicious enough to be female) and drifts towards us then stops. I wonder whether people have been feeding him as I know this is a dangerous thing to be doing to an alligator as they lose their fear of humans. Anyway, he doesnt need any additional food as the pond is full of fish and other wildlife. I suppose Disney will move him the morning someone wakes up to find him in the pool. Back to the room with Georgia for her to have a sleep for an hour, then we all get changed and catch the boat to the MGM Studios, then a bus to the Animal Kingdom Lodge. This is only the second time Ive been here and its just as impressive as the first. 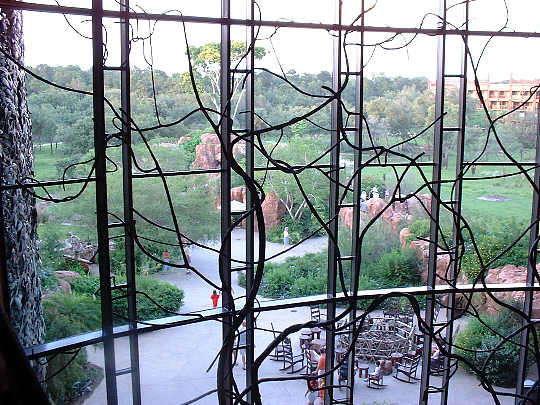 The window at the far end that looks out towards the savannahs is the most wonderful part of the whole place for me. Its both a window out and a window in, especially after dark when the subtle oranges and yellows highlight this beautiful resort. We have an 8:10 pm PS for Boma, but only have to wait 10 minutes to be seated. There is a bewildering array of foodstuffs here, most of which has an African flavour. The food is good, especially the soups and prime rib. Although I enjoy it all, I cannot help but feel a little aggrieved at a $100 bill for a buffet. If Im paying that sort of money I prefer quieter surroundings and someone serving me please. For a little more we could have eaten at Jiko, a far more pleasant eating experience in my eyes. I know this may seem silly after praising the California Grill for having a buzzing atmosphere last night, but it works there. Maybe if Boma was less full I would have enjoyed it more. I suppose Im not really a buffet person. The first few times you try a buffet you are a bit like a kid in a sweet shop, so much food that you try to eat yourself sick. These days I much prefer smaller but more well prepared courses that enable you to spread the meal over a whole evening. Another look around the Lodge and we go to the bus stop intending to get a bus to the Studios and then walk along the river to the BCV. A bus pulls in and the driver asks us where we are heading. We tell him and he says to hop aboard and hell drop us off at the Villas. Now this is definitely the biggest taxi Ive ever been in. When we get back we have a look around the grounds at night. Im still amazed at how peaceful it is. Also its teeming with wildlife. So far, as well as the numerous birds and butterflies, we have seen an alligator, lots of rabbits, squirrels, lizards, dragonflies, a frog and a fire breathing dragon. Back in the room and in bed by 11:30 pm.